but i want to document the progress of this FJ! i've been a toyota guy for a long time (got a tacoma when i was 16). then a 99' 4Runner SR5 (supercharged), now this FJ - i plan on keeping it...forever..? ok so, i bought it in April 2013.
the Sierra Anchas (Cherry Creek road) in May! 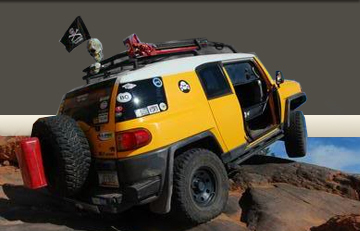 this past weekend (07-27-2013) i had the FJ lifted. Light Racing upper control arms, & front diff drop. buddy's shop installed it for me (UMS Racing in Mesa). here is what she looks like today. no other "real" mods yet. ordered a TRD stainless exhaust & a River Raider expedition snorkel. ...then equip the rack proper with some gear. stayed tuned & i welcome all comments! I did the upper portion of cherry creek road a couple of years ago, and some of the lower portion. I have come across several cabins in the Anchas, but not this one. What area is it in? @bolts: thanks man! should i have posted links?? There's a cat on those boxes! Meow! I know it's really tempting to do the cat mod, but it doesn't work out nearly as good as you'd think. It turns out to be quite difficult to find a set of 4 matched cats. I have looked at the river raider snorkel online and am curious to learn more about the install. It seems it would need an extension though to help with dust. I'd check with our resident glass expert before I'd go with the River Raider snorkel. It looks to be a PITA to remove when replacing the windshield. Install looks to be questionable as well. Good info Mark! I kinda thought it looked a little sketchy on the install, but I was only looking at pics on the intertube. I like that it's different, but if it doesn't function well then it's not worth it. I will be following Brent's build thread to see what he has to say. I really dig these cement colored FJ's. the river raider has the option of having the extension for an extra $31.50. and you're only supposed to use it off-road (when you need it). which made me think it was relatively easy to put on/off. im hoping the bell comes off easy for windshield replacements & extension swaps. the 4runner needed 2 windshields a year, the FJ looks like its gunna be worse. y'all have me thinking i should give them a ring before they ship it! i will report back with any/all info i get! thx guys! Any updates on that River Raider? that the record for newest FJ on the trail was 3,500 miles..
i wish i had documented it, but i hit the Sierra Anchas (Cherry Creek road) in May 2013 with only 2,200 miles! i had the river raider snorkel sitting in my garage for over a year, because i became hesitant to install it. how long it would take to complete (day, weekend?) also, the issue with installing new windshields and body clips. so, one day when brian and jen were installing my windshield, i told brian about the snorkel debacle. he offered his knowledge on clips for the body pieces, and how i would have to take it apart to install it. i took note. recently, i got a bug to just get it done! and i was tired of looking at the box in the garage. (and i needed another windshield). i gave brian a call. he was all for tearing my truck apart! so this past weekend, we tackled this weird little snorkel. we had to disassemble quite a bit to get to where we needed to be. making their snorkel work for the FJ. i have drove the FJ for a few days now, and haven't noticed anything (wrong) with the truck. gutted. hood hinge and all! getting this in... too many tight turns! getting the air box sealed up and rerouted. and knowing everything about those damn clips and body pieces! good guy to wrench with for sure! that is a good looking piece and will minimal changes to the FJ. Fuel MPG difference? Rocky road my favorite terrain not ice cream.